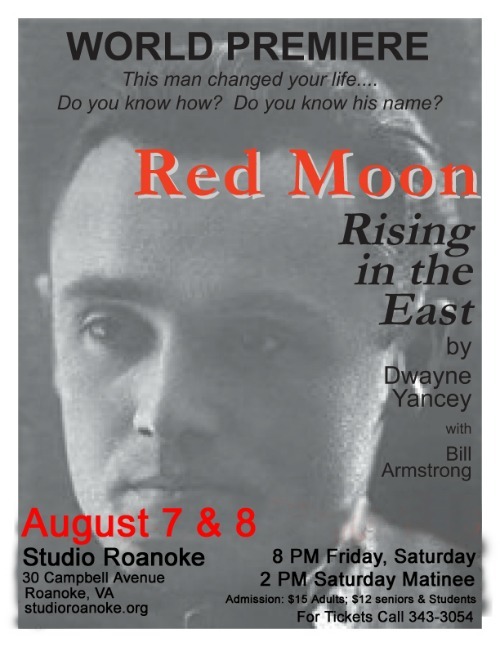 Here’s the poster that was used to promote “Red Moon Rising in the East” — first at 40th Street Stage in Norfolk, then this edited version for its special run at Studio Roanoke — in summer 2009. This entry was posted on January 18, 2012, 3:29 am and is filed under Photos, Uncategorized. You can follow any responses to this entry through RSS 2.0. You can leave a response, or trackback from your own site.